Veronica steps from the crowd so she can wipe the blood and sweat from Jesus’s forehead and face. 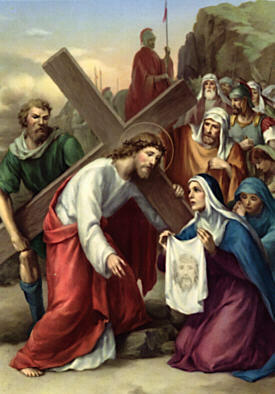 By doing this she showed her love and concern for Jesus. It was not much some may say but Veronica did what she could to help Jesus. We are all called to help one another, even in the smallest of ways. Just smiling at someone or holding the door is an act of kindness. When we think of doing charity work, we think of doing grand things like soup kitchens, clothing drives, etc.. They are all great things but not everyone can do them for their own reasons. Yet there are other things we all can do. What are someways that someone just out a smile on your face when you were down? Has someone told you that you made their day and you have no idea what you did? These questions happen more then we know. The little things in life helps us to move on sometimes when we do not think anyone cares or understands. They are the extra push that we need. Veronica did what anyone else in the crowd could have done. The difference is that she did it when no one else did. She stepped away from the norm of the crowd to do something kind for Jesus. Sometimes we need to step from the norm of the crowd to do what is right. When someone drops what they are carrying, help them pick them up instead of laughing. Lend a helping hand instead of a pointing finger. You see a mother trying to open the door and get the stroller in the store, hold the door for her. There are many many little things we can do each day for others. Once you start it will be just part of the normal day to help others. It is not just in doing extraordinary things that we can be the Hands and Feet of Jesus but it is also in the small day to day things we can do as Jesus asks of us. Until tomorrow, God Bless, and remember Jesus in the grand and small things.